Sir John has also received an Honorary Degree from Bangor University.An eminent British chemist who began his academic career at Bangor University, is one of three leading scientists to receive a Royal Medal this year. Sir John Meurig Thomas Hon FREng FRS is awarded the 2016 Royal Medal for his pioneering work within catalytic chemistry, in particular on single-site heterogeneous catalysts, which have had a major impact on green chemistry, clean technology and sustainability. 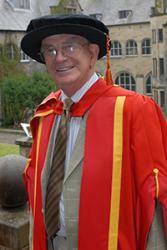 Sir John was among the first people to be awarded an Honorary Degree to mark the University’s 125th anniversary. He is Honorary Professor of Solid State Chemistry, University of Cambridge, and former Master of Peterhouse, Cambridge. Sir John Meurig Thomas began his academic career teaching and researching at the School of Chemistry, at the age of 25 at Bangor in the late 1950s. The three Royal Medals, also known as the Queen’s Medals, are awarded annually by the Sovereign on the recommendation of the Royal Society’s Council. Frederick Sanger FRS, Max Perutz FRS and Francis Crick FRS are among those who have been awarded a Royal Medal. Each year two medals are awarded for the most important contributions “to the advancement of Natural Knowledge” in the physical and biological sciences respectively. A third medal is awarded for distinguished contributions in the applied sciences. “Our School of Chemistry at Bangor has a long and distinguished history. A number of our founding Professors became Fellows of the Royal Society, and staff and students have made significant contribution to chemistry over the decades.